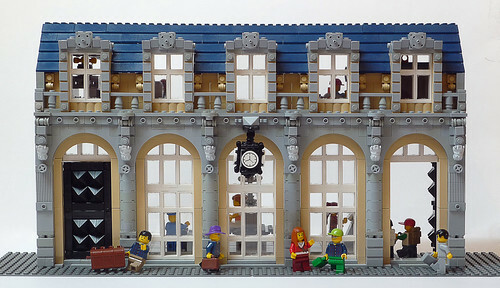 Brick Town Talk: Back on the Rails - LEGO Town, Architecture, Building Tips, Inspiration Ideas, and more! London, England - (BTT) As airports across the world continue to think of new ways to poke and prod the weary traveler, there is a certain romance to the humble railroad that has seen a bit of a resurgence as of late. A large part of the mystique lies in the stations themselves; relics of another era when travel was a momentous event rather than a bothersome burden. With its grand arched windows and bustling interior, this historic station gives proper respect to the term "first class."